Thanks for stopping by! I think it's just great when people take a look at me. And let's be honest, why shouldn't they? I'm easy on the eyes, aren't I?" "My name is Shirley. I am a 9 year old female who was found as a stray. I've been visiting with the wonderful folks here at Wayside for a couple of weeks. It's very nice here. Have you ever played with a feather wand? If not you should. It's my favorite toy. I am a big beautiful girl. I have thick fur that is both black and brown. I have a personality they like to call Leader of the Band. That's because I am adventurous and outgoing. Really brimming with confidence, ya know? Come give me a pet, I'll purr for you and you won't want to stop. My human thinks you are beautiful, Shirley! But of course she has a weakness for multi-colored kitties like you. I think Binga would be called a Leader of the Band too! What a beauty you are, Shirely! We hope that someone soon will want to do a lot more for you than just stop and admire you for a moment. 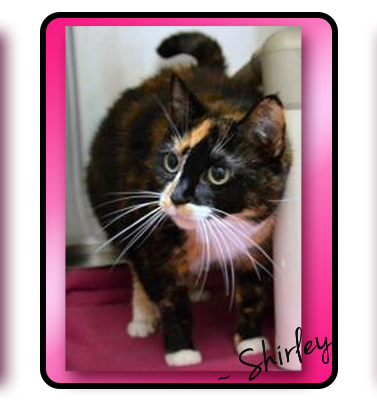 Shirley - you are beautiful and I love your whiskers. Paws crossed for a happy home for you! Good luck to sweet Shirley. Have a wonderful Wednesday. What a gorgeous coat! Shirley, you are such an eye-catcher, we hope that your forever family stops to take a look at you very soon! You are such a beautiful girl, Shirley! We love how your coat is so shiny and glossy. BEAUTIFUL! Shirley looks like a diva. I'm sure somebody will definitely check her out. Shirley is a looker for sure! Wanna move over to my pad?